Everything was great. The beach and all around was nice. Food was good. The staff was nice. View was amazing. Best location with own beach (2), one beach greet for snookering, second great for children. Clean apartments, with nice view (b116 ap) The sea is ok for swim in October. Nice pools, but cold in October , its can be better in summer . Kitchen is ok for cooking, apartment is comfortable. Wifi is 5star fast and great signal. You can buy breakfast (12 EUR) or dinner (20,85 EUR) or half pension (30,06 EUR) directly at hotel, its better choice then book it here. (cheaper, and you can buy it for a day too) The food is average I do not eat every day because there are plenty of good restaurants in the neighbourhood. You can choice late check out for 40 EUR (till 6pm). Good playground for children, English and German animation for all day for kids. Nice and very practicable appartment. Very short ways to the beaches/the sea and the pools. Breakfast with variety of food change from 2 options every other day. Excellent location with good pools and a wonderful beach 2 mins away, great breakfast buffet! We loved the private beach and the peacefulness of the hotel, Staff was very friendly and helpful. 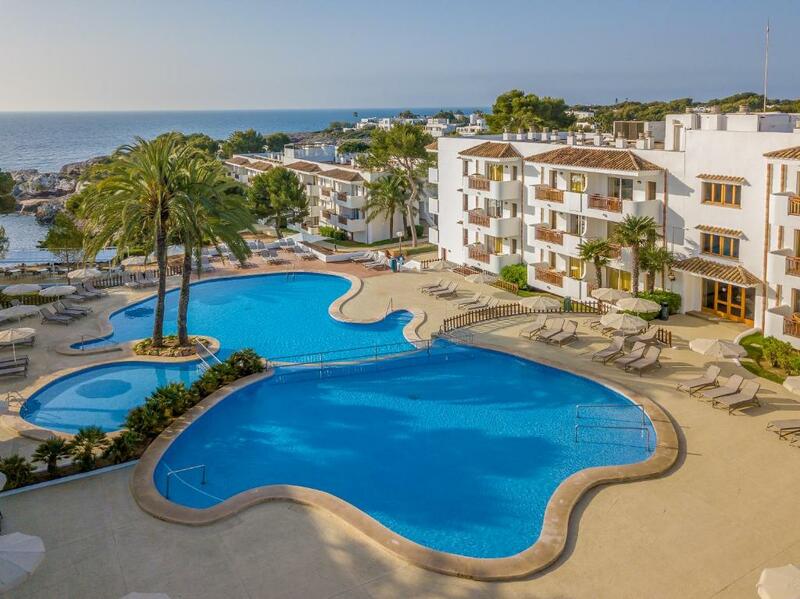 Lock in a great price for Inturotel Cala Azul Park – rated 8.7 by recent guests! 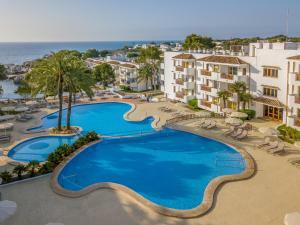 Inturotel Cala Azul Park This rating is a reflection of how the property compares to the industry standard when it comes to price, facilities and services available. It's based on a self-evaluation by the property. Use this rating to help choose your stay! One of our top picks in Cala d´Or.Inturotel Cala Azul Park has an outdoor swimming pool and extensive gardens, with pine and palm trees. 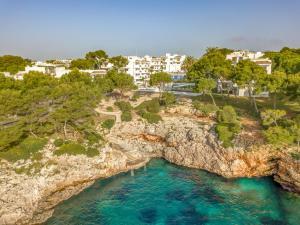 It is set in Mallorca’s Cala d’Or, a few feet from Cala Esmeralda Beach. This apartment complex offers an indoor swimming pool and hot tub. There is also a sauna and a fitness center. Outside, there is a tennis court, mini golf course and a children’s play area. 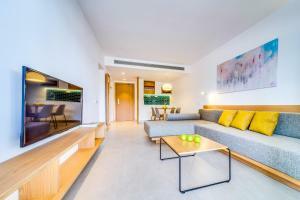 Apartments at Inturotel Cala Azul Park have a balcony and air conditioning. They have a living area with satellite TV. There is a small kitchen with a fridge. Free WiFi is available throughout. The complex has a bar and a restaurant. Free WiFi access is available in public areas. There is also a 24-hour reception desk, with currency exchange. Guest will find a range of shops and bars within walking distance, while the center of Cala d'Or is 0.6 mi away. There is free public parking nearby. 뀐 Located in the top-rated area in Cala d´Or, this property has an excellent location score of 9.3! When would you like to stay at Inturotel Cala Azul Park? This comfortable and stylish apartment features a balcony with views of the shared pool, pretty gardens or the sea. They have a lounge featuring 2 sofas, a kitchenette and full bathroom. Free WiFi is available. A safety deposit box is available for a surcharge. This comfortable and stylish apartment features a balcony with views of the shared pool, pretty gardens or the sea. They have a lounge featuring 1 sofa, 1 sofa bed, a kitchenette and full bathroom. Free WiFi is available. This comfortable and stylish apartment features a balcony with views of the shared pool, pretty gardens or the sea. They have a lounge featuring 2 sofa beds, a kitchenette and full bathroom. A safety deposit box is available for a surcharge. Free WiFi is available. Please note, a child up to 14 years old can stay in this room type. This comfortable and stylish apartment features a balcony with views of the shared pool, pretty gardens or the sea. 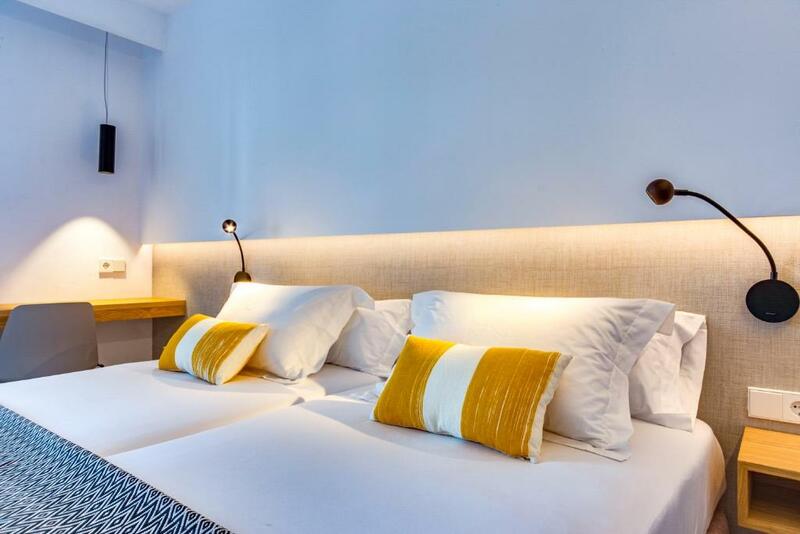 They have a lounge featuring 1 sofa, 1 sofa bed, a kitchenette and full bathroom. A safety deposit box is available for a surcharge. Free WiFi is available. This comfortable and stylish apartment features a balcony with views of the shared pool, pretty gardens or the sea. They have a lounge featuring 2 sofa beds, a kitchenette and full bathroom. A safety deposit box is available for a surcharge. Free WiFi is available. Please note, 2 children up to 14 years old can stay in this room type. This studio features a balcony, kitchenware and dining area. A safety deposit box is available for a surcharge. Free WiFi is available. This apartment has a balcony, dining area and kitchenware. Free WiFi is available. This apartment features a balcony, toaster and kitchenware. Free WiFi is available. This apartment has a balcony, satellite TV and tile/marble floor. Free WiFi is available. This apartment features a balcony, electric kettle and dining area. Free WiFi is available. This apartment has a balcony, toaster and tile/marble floor. Free WiFi is available. This apartment features a balcony, toaster and electric kettle. Free WiFi is available. This apartment has a balcony, kitchenware and tile/marble floor. Free WiFi is available. This apartment features a balcony, air conditioning and toaster. Free WiFi is available. Confortables apartamentos de 1 dormitorio y estudios, ideales para parejas o familias, harán su estancia inolvidable. 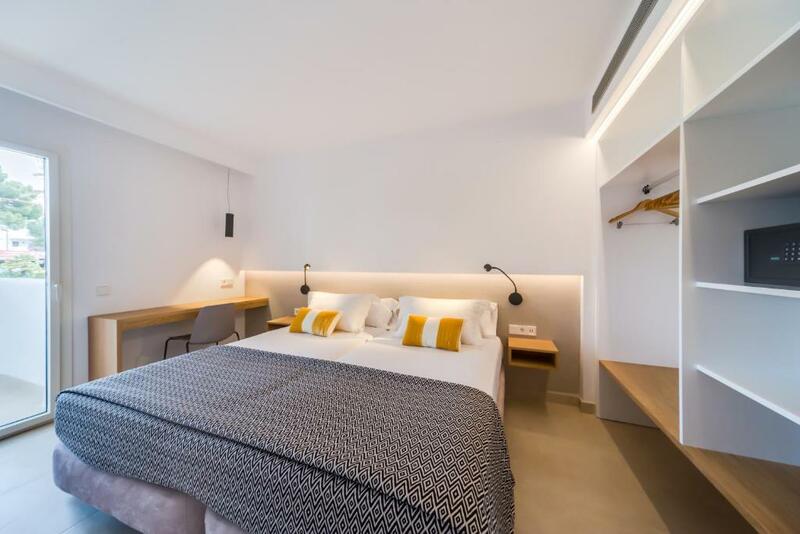 Decorados con estilo y magníficamente equipados con baño completo, kitchenette, sala de estar con 2 sofá-cama,y amplia terraza amueblada con preciosas vistas al mar, a la piscina o a amplios y cuidados jardines mediterráneos. 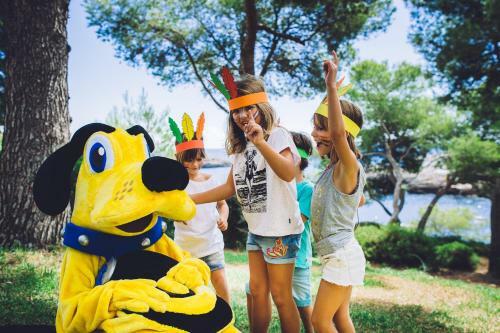 House Rules Inturotel Cala Azul Park takes special requests – add in the next step! Inturotel Cala Azul Park accepts these cards and reserves the right to temporarily hold an amount prior to arrival. Great food, great variety of good quality products. Constant smoker on balcony next door. Cleaning not daily. No dishwashing liquid. Payment upfront. Basic. Food for masses - no taste no quality but you get what you pay for basically. View if you are in the right block facing sea. Good for kids who know no better. *Prices - restaurant are not cheap not not over the top with the price, cocktails are quiet expensive unless you buy on happy hour, unfortunately its only for one hour. *hotel - A lot of children running around. Seems like the hotel is perfect for families but if you travel with your partner then you might find it too much as we felt like the only couple without children around. Only right wing is for adults only but the rest is full of children and the hotel is mostly running to direction of accommodating the families. Nothing wrong about that but we should have been warned. Also I didn't like that you have to pay for sunbeds by the beach even though they are on the hotel area. The beds were far to hard. The noise from buses/trucks during night (near parking/resort). Our room in ground floor was having a little bit damp smell, but we booked the cheapest room so i am sure the upper rooms should be fine. We had requested a sea view which we could not have until day 3 of 5. We asked for an hour long late check out which we could not have. The overall atmosphere and location were super. Everywhere was extremely clean and in particular the cleaning staff were charming.